One thing we know for sure is that executives of big corporations are frustrated at the slow pace and quality of organic innovation. Some of the problem is due to slow decision-making, bureaucracy, and the batch-and-queue stage-gate processes. These combine to reduce the curiosity and thinking required for innovation to flourish. Not knowing the root cause, executives desperately grasp for solutions, the most prominent one of which is spending money to buy innovation from other companies and especially startups. The total cost of this approach is high because the company retains internal capabilities for innovation and also spend a lot of money to acquire it externally. Innovation is very important to an organization’s survival because it drives sales growth. Innovative products and services command higher prices and larger profit margins. It also gives the customers and others the impression that the company is in-step with the times, attuned to customer’s wants and needs, reliable, trustworthy, and even exciting. Yet, innovation is not just creating budgets for teams to develop new products and services. People must be allowed to think. 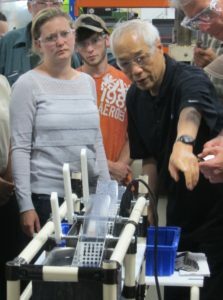 Toyota-style kaizen creates a unique environment in which people are allowed to think and come up with ideas, and also immediately try them out. Kaizen participants are nearly always surprised at what they were able to accomplish. They do in a few few days that which they could not accomplish in years. How does kaizen do this? Kaizen teaches people to question everything and think differently about problems. This capability is a fundamental precursor to generating the flood of ideas that lead to innovation. Kaizen is guided by boundary conditions that channel people into using their brain instead of money to innovate. These boundary conditions take people back to zero, to help people see problems differently and identify numerous alternative solutions. Kaizen also requires people to quickly test their ideas to determine which ones satisfy the need. So instead of “brainstorming,” the focus is on “trystorming” – trying out different ideas by quickly building prototypes and mock-ups, thereby learning with one’s hands. Making things and learning with one’s hands is supremely important because it is a deeply encoded in human development over the millennia. People like to make things; they find it very satisfying. Employees – both managers and workers – should be given as many opportunities as possible to make things. You will be amazed at what they create. The innovations that I have witnessed in kaizen, for both process improvement and new product development, is remarkable. But more than that, it develops employees’ capabilities and enables them to contribute fully to the organization – which is what most people want to do. It pleases employees and will also please customers and investors. So, think of kaizen – kaizen forever – as a simple and low-cost (and largely budget-less) innovation strategy. Kaizen has so many positive knock-on effects that you will soon view the common methods once used to drive innovation as both plodding and ineffective.